BenchPro manufactures a complete line of America's finest workbench. The company designs premium and economy workbenches for any medical laboratory, class 100 cleanroom, bio-chemical environment, electronic production, defense and military, aerospace, and material handling condition. On top of the custom ESD carts and industrial chairs, BenchPro offers a 25 year unconditional warranty and a 5 minute bench assembly. 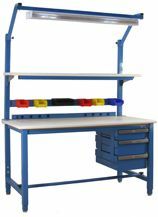 Each workbench can be customized to meet specific requirements. No request is too unique. Return PolicyRefund policy: 14 days, Item must be return in unopened original packaging, buyer pays return freight.